In case you are wondering, my profile photo shows the picture of St. Lorenzo Ruiz, first Pinoy saint and protomartyr of the Philippines. He was martyred during persecution of Japanese Christians under the Tokugawa Shogunate in the 17th century. Lorenzo Ruiz was born in Binondo, Manila between 1600 to 1610. His father was Chinese and his mother was a native Tagalog. 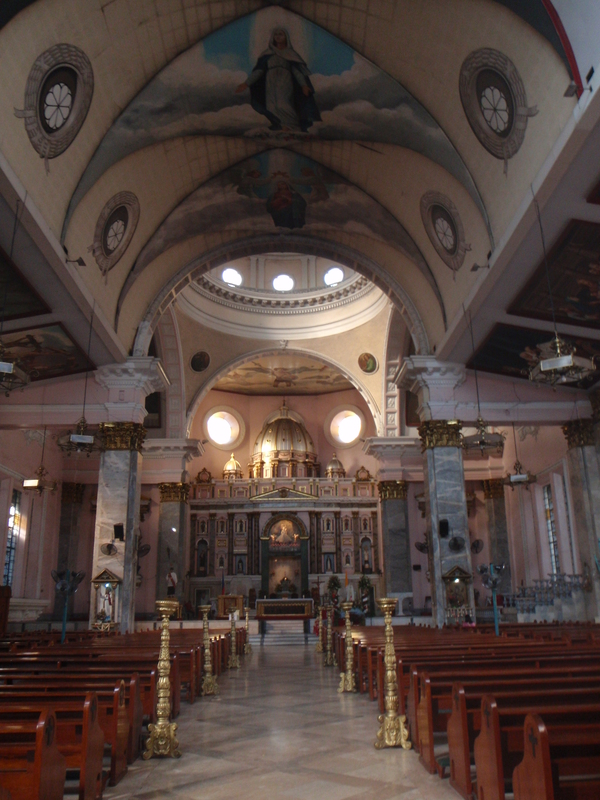 During his youth he was an altar boy, sarcistan at the Binondo Church which serves the Filipino-Chinese community. He was educated by the Dominican Fathers and was their escribano (scribe) because of his skillful hand and unsurpassed penmanship. It is most commonly believed that he left the Philippines in 1639 because the Spaniards believed he had committed a crime against them. He left his wife and three children on 10 June 1636 with the aid of the Dominican Fathers led by Fr. Domingo Gonzales. He initially thought that they were bound for China but he later learned that the Dominican Fathers were in fact on a mission to plant the seeds of the Faith in Japan. In Japan, Christians were persecuted and put to death as order by Tokugawa Yeyasu, the reigning shogun. St. Lorenzo Ruiz together with his imprisoned companions were captured and brought to Nagasaki around 10 July 1636. 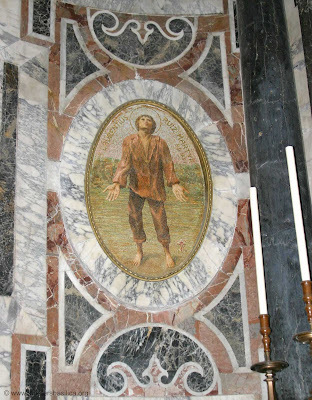 There they suffered incredible torture as they were hung by their feet and submerged in water till they neared death which brought some of St. Lorenzo's companions to recant their faith. Needles were pressed in between their finger nails and skin and they were beaten unconscious. These needles were then plucked like guitar strings. St. Lorenzo never lost his faith. On 27 September 1637 he was taken with his companions to the "Mountain of Martyrs", the place of execution. There he was hung upside down into a pit in what was called a 'horca y hoya'. This was the most painful way to die in those times and involved using rocks to add weight to the person so that the person suffocates faster and is crushed from their own and added weight. After two days, St. Lorenzo died. His body was cremated and his ashes were thrown into the sea. He was beatified by Pope John Paul II during the Papal visit to Manila on 18 February 1981, the first beatification outside of Vatican City. St. Lorenzo Ruiz was elevated to sainthood and received canonization on 18 October 1987 by His Holiness Pope John Paul II in Vatican City, Rome. According to preserved records of his trials, when asked if he would renounce his Faith in order that he may live, St. Lorenzo said in reply, "That I shall never do, because I am a Christian and I shall die for God. I did not come to Japan to die as a martyr but for Him I will give a thousands of lives if I had them. And so do with me as you will please." The miracle that led to his canonization took place when Cecilia Alegria Policarpio, a 2 year old girl suffering from a rare brain disease, brain atrophy (hydrocephalus), was cured through the intercession of the family and supporters to Lorenzo Ruiz. This took place in 1983. She was diagnosed shortly after her birth and was treated at Magsaysay Medical Center. Primary Treating Physicians was Dr. Felicidad Sotto. I remember reading a magazine article of the child's cure. She was shown holding a statuette of then-Blessed Lorenzo. When asked what happened, she said that she was lying on her sick bed, almost motionless from the pain of her brain disease when she noticed a light coming from where here feet were. She noticed a man holding a rosary, looking heavenward. The man did not speak and she did not know who he was. The vision did not last long. The following morning she was already feeling well and was even sitting on her bed. What she did not know was that her mother and friends prayed a novena to Blessed Lorenzo and placed a picture of the Beato on her pillow. Well, that was what I remember from that article. This is a mosaic found in the Altar of the Crucifixion of St. Peter in the Vatican ArchBasilica. If you look closely, this is the inspiration for the bronze statue given by Blessed John Paul II to the Filipino people after the beatification of Lorenzo and his companion martyrs. 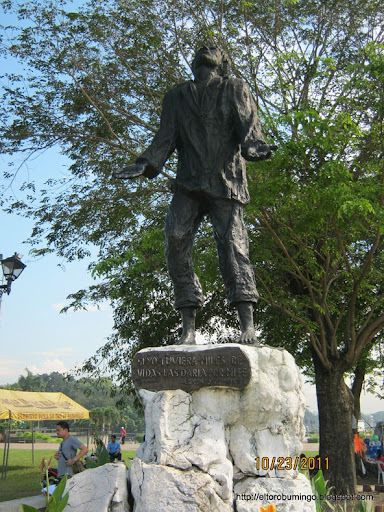 The statue is located at Rizal Park. Another bit of trivia. Notice the tree at the back? That was planted by Pope Paul VI when he visited the country, the first pope to ever do so. Some useful links regarding the so-far only Pinoy Saint. May every filipinos have faith as lorenzo even in the midst of trials..
Lorenzo Ruiz De Manila School is a Private Catholic School in Cainta - The only school in the Philippines that uses solar powered air conditioner. Visit my website to inquire. "Deny your faith and we will spare your life," his persecutors said. To which Lorenzo Ruiz answered, "I will NEVER do it. I am a Catholic and happy to die for God. If I have a thousand lives to offer, I will offer them to God."